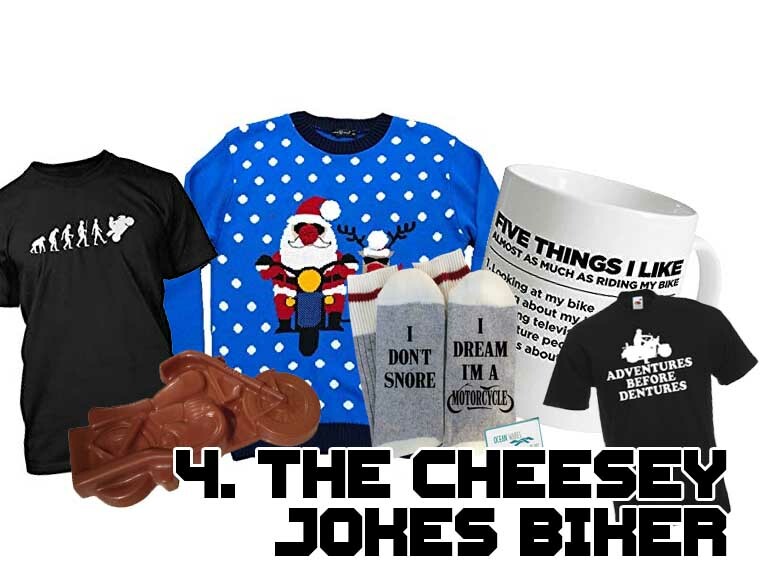 Christmas is just around the corner and for many relatives of bikers, the season of difficult Christmas shopping is descending upon us. Bikers are an exceptionally rare breed of human whom quibble over dropping £1.20 on a Greggs Steak Bake but have no problem throwing £300 away on a new set of tyres. So how on earth do you purchase a reasonably priced gift for someone with an insanely expensive hobby? Well, don’t fear. 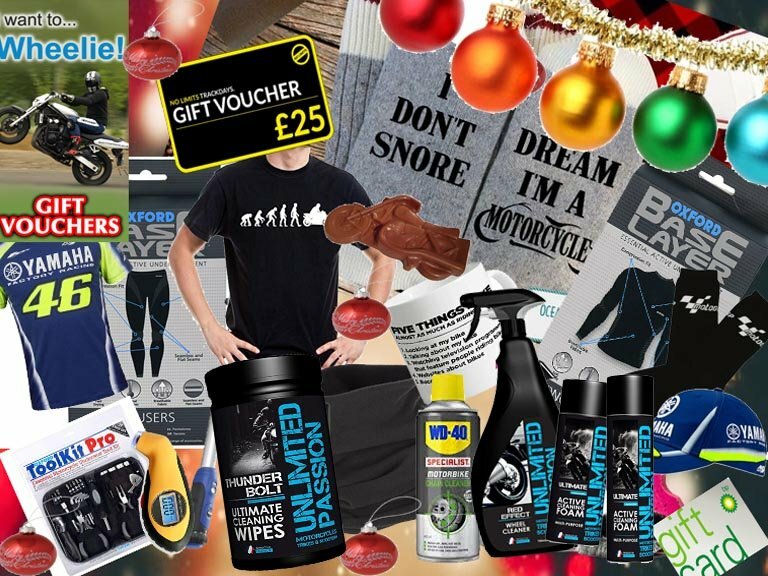 We have your back in this list of 5 bundles you can put together for a biker for under £50! Pro-tip: You can click on each item in the list to take you directly to the product! We all know a biker who just seems to have 4 broken engines in his garden and a bike in his garage that’s “Nearly finished but not quite!”. In his head, he’s the next British Super Bike Mechanic. 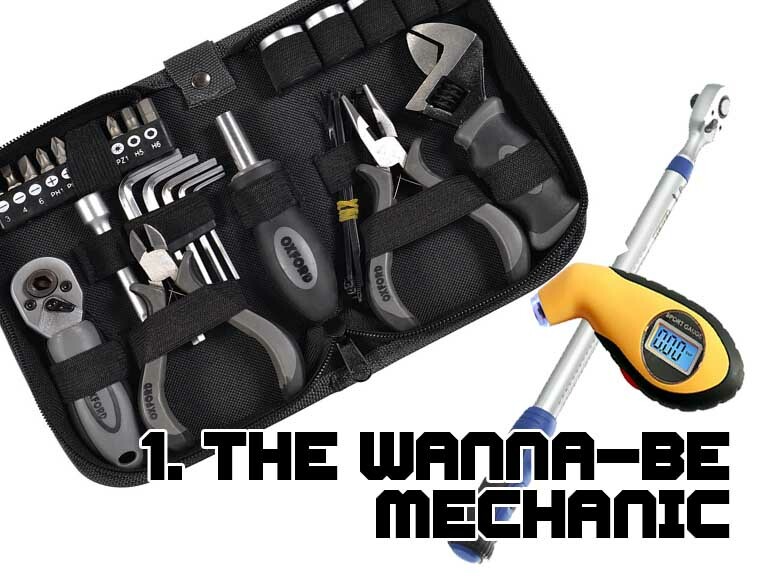 You can’t go wrong with a multi-tool kit and a torque wrench. If you really want to go the extra mile, don’t forget to throw in the Duct tape for £1 for when it all goes wrong! He’s still wearing last weeks hoody and his bike looks like he went off-roading. Yes, it’s the messy Biker. Let’s be honest, what could be more thoughtful than a passive-aggressive Christmas gift that lets him know it’s time to clean his bike. 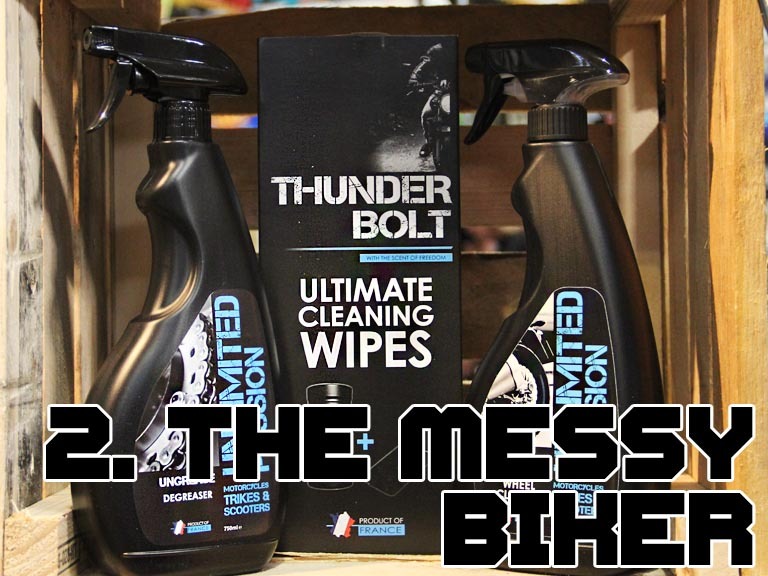 Unlimited Passion products are the perfect gift for lazy bikers. Simply spray the cleaning foam, do nothing for a bit, and simply wipe away the dirt. Done! GRAND TOTAL: £58.98 -However add our discount code @slant18 to bring the total down to £49.54. Simply click on the link to each product, add them to the basket and proceed to add the above code. They’re invited on a fun ride around the twisty’s. A few Miles in, they want to stop for coffee at a cafe just 7 miles from their front door. It’s time to show you’re caring side and wrap them in cotton wool, literally. Here are 4 products you can get for your frosty rider that won’t break your budget. If you’re looking at this, chances are your biker is over the age of 50, owns a chopper and shares game requests on Facebook. He shows up to Christmas parties telling Dad jokes whilst drinking all the good beer. You’ve heard his mod and rocker stories more times than you can count. This bundle is guaranteed to lighten up his thinning hair. No Limit Track Days – This site allows riders to pick between both UK and European motorcycle track days with just one single voucher. Track Days – Currently giving an extra 5% off orders, it seems like a winner. You can also select from a variety of car hire and bike hire track days too. Virgin Experience Days – If you’re uncertain whether a motorcycle gift voucher will go down well or not, check out Virgin. 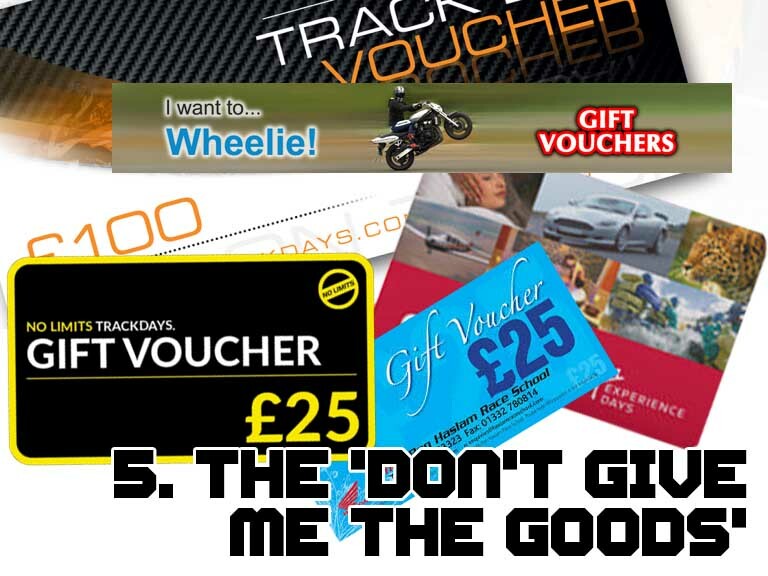 Their vouchers can be used towards any Motorsport adventure or even another day out if they fancy. Extreme Wheelie School – Track days aren’t for everyone. But you know what is for everyone? Showing off. IWantToWheelie Wheelie school based in Yorkshire has a fantastic reputation and is guaranteed to get your favourite Biker showing off at the Red, Yellows and Greens! There you have it, folks. Don’t forget you can passively-aggressively post this article on your dearly beloved friends and families so you can avoid the cliche gift of being handled micro-fibre cloths, Muc-off gift packs and a shower gift set! Previous articleLIVE: Manchester Ring of Red 2018- Can you spot yourself?